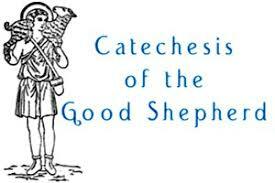 Catechesis of the Good Shepherd is based on the belief that God and the child are already in a relationship. Our work as adults is to provide a place for the child and God to come together and grow. The atrium is a specially prepared room where children can come to know Jesus, the Good Shepherd. It is prepared with materials that children work with as a way of meditating upon the essentials of our faith found in Scripture and in liturgy. Some materials include small clay figures of Jesus and the disciples used to meditate on teh Last Supper; interactive maps of the Land of Israel and the City of Jerusalem to help situate Jesus as a real person in time; Jerusalem Mustard Seeds and beautiful pears to help ponder the Parables of the Kindgom of God; and a small Baptismal font and Paschal candle used to explore the significance of Baptism. "If God is presented to the child through tangible and meaningful activities, it will do more for the child than just arouse interest; it will create in the child a sense of joy, admiration and wonder."